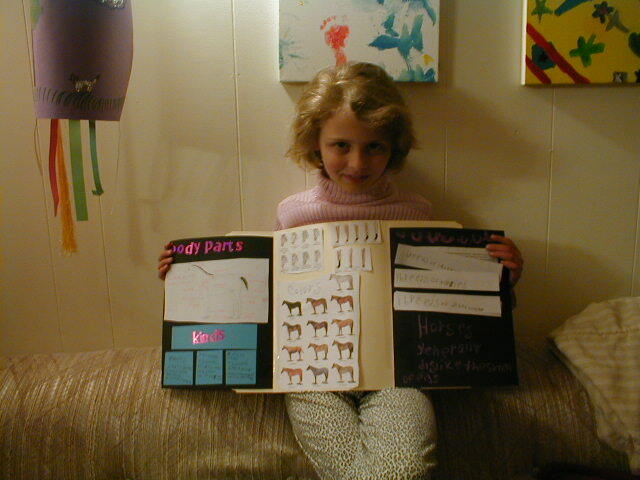 Anna did a horse lapbook the other night, all in one night. She really had fun and we both learned a lot. I printed out various things that I found online doing google searches for horse images and horse facts for kids. I found some really neat stuff that Anna didn’t want to use, like a chart of horse skeleton evolution over the years (they were originally very small and were eventually bred to be bigger and stronger over the years by man). She proclaimed that sheet “disgusting” because it was bones. LOL This from a little girl who proudly bagged up the deer skull she found in the wetlands! 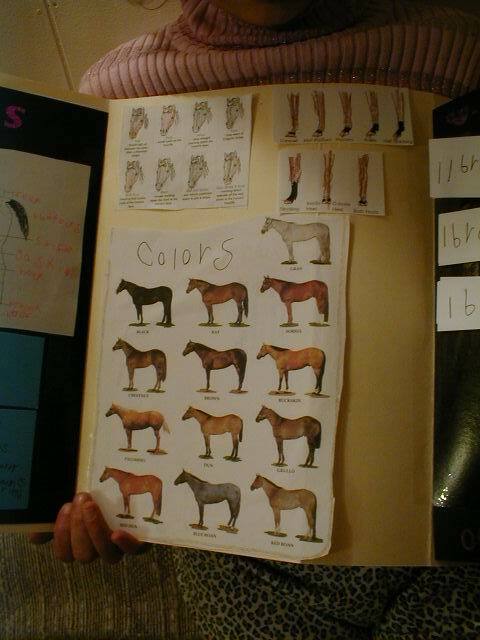 Some of the parts of the lapbook include a page where she labeled all the parts of a horse, a page showing all the face markings and what they are called and one with leg markings, lift the flap trivia questions, a coloring page, information like the horse family (equus) and how much they sleep (2 1/2 – 3 hours a day, more in summer than winter), a photo of the world’s smallest horse (Thumbelina), an explanation of the three types of horses (ponies, light and draft), stapled lists for each group of the breeds and characteristics, and a little blurb about Mr. Ed. 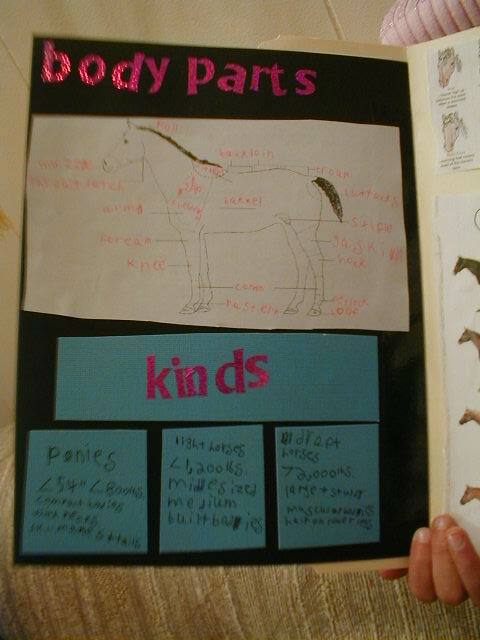 This entry was posted in Anna, Lapbooks, pictures, science by Alicia. Bookmark the permalink. 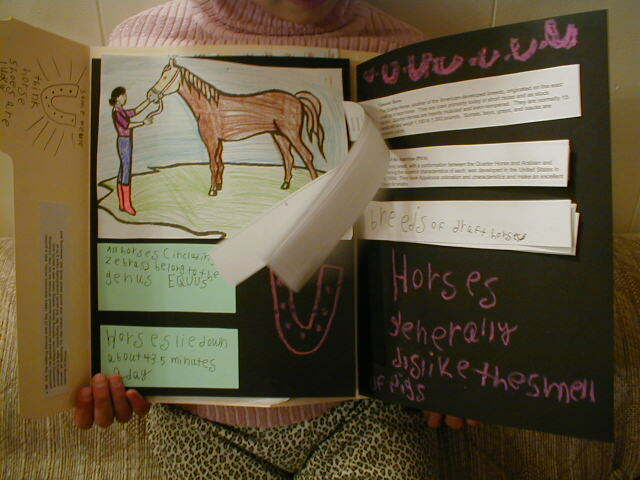 My girls are very inspired by your horse lapbook – thankyou for sharing it. They are off to do theirs now. Very cool! 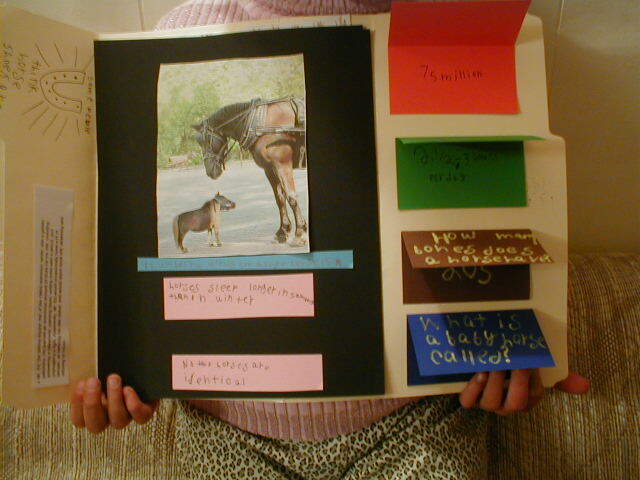 I am working on gathering resources for a horse unit study/lapbook. Did you read any library books for your study? I like that you let your kids have the say in how their book is created. I need to take of the teacher hat more often and let my kids enjoy the process. 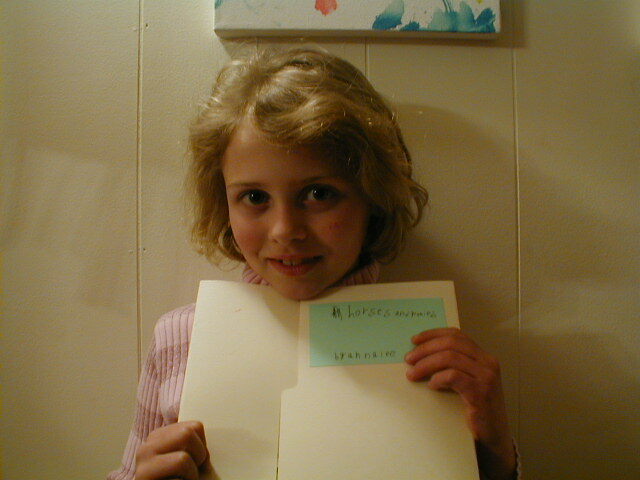 I enjoyed looking at your blog! Sometimes they use books but more often I just print out a variety of information from the net. I cut and paste interesting bits onto a blank page and print that all out, and let them read those facts and stories to choose what to include. I put them in different sizes and fonts so they can cut them out and incorporate them or they can change that info into question flaps they write out and such. I am a very big fan of horses, i think you did a very good job of making your lap book. I would make one but my printer doesn’t work right. So i just draw pictures of the horses online. I have a horse named Jade she is very gentle, and very sweet. I would ride her but she bucks. We don’t want to get hurt. the only time we can ride her is when my aunt comes over. It stinks! KEEP MAKING LAP BOOKS AND YOU COULD DO SOMETHING VERY SPECIAL!! !